Fixed Hydrogen Gas Detector incorporates multiple alarms. Designed for use in unattended battery installations or remote shelters containing gassing lead acid batteries and charging systems, HGD-3000 protects against hydrogen gas buildup while also detecting smoke, temperature, loss of power, and intrusion. Unit mounts to wall, ceiling, or optional junction box and turns on exhaust fan when hydrogen gas levels reach 1%; alarm – local 80 db horn,Â flashing red LED, andÂ dry contact switch closure – activates at 2%. Hydrogen Gas Detector with Smoke Detection, Loss of Power, Temperature and Intrusion Alarms! How Protected are your Battery Rooms? Milwaukee, Wisconsin – Eagle Eye Power Solutions is introducing the HGD-3000 Hydrogen Gas Detector – the ultimate fixed hydrogen gas detector for any battery room. The HGD-3000 protects from hydrogen gas buildup while detecting smoke, temperature, loss of power and intrusion. The HGD-3000 was designed for unattended battery installations or remote shelters containing gassing lead acid batteries and charging systems - most commonly found in the telecommunications and utility sectors. Other applications for hydrogen gas detection include forklift and golf cart charging areas, data centers, mission critical facilities, fire departments, and other battery charging rooms. Attach the HGD-3000 to the wall, ceiling, or optional junction box using the mounting holes at the top and bottom of the detector box. The HGD-3000 will turn on an exhaust fan when hydrogen gas levels reach 1% and will alarm at 2%. This alarm consists of a local 80db horn, a flashing red LED, and a dry contact switch closure for remote alarming. The photoelectric smoke sensor detects minute combustion products from smoldering wire insulation, battery cases, and other material. When smoke is detected, a distinctive alarm is emitted from the 80db horn and a separate dry contact switch is activated. At this time, the exhaust fan is inhibited in order to deny the fire increased oxygen from outside air. During normal operation and in the absence of an alarm condition, an internal thermostat will turn on the exhaust fan at a preset temperature to reduce heat buildup in the room. Loss of power to the unit will also generate a dry contact alarm. Additionally, an optional infrared intrusion alarm will trigger a silent dry contact switch. Lead-acid batteries on charge emit hydrogen gas after reaching the 80% recharge point. When mixed with enough air, hydrogen becomes a highly flammable gas that can ignite easily with just a spark, destroying equipment and harming personnel. The lower explosive level (LEL) for hydrogen is 4.1% by volume. The dangers of hydrogen gas explosion are eliminated by using the HGD-3000 hydrogen gas detector. SG-500 Portable Digital Hydrometer comes with specific gravity scales. 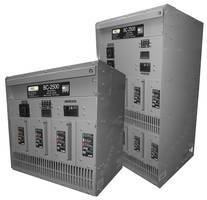 BC-Series Line Battery Chargers are suitable for UPS and transportation industries. Automatic Battery Charger keeps golf carts ready to go.